The first week of the postseason has created quite a few headlines both on and off the ice, some of which are highlighted in the top stories of the week. Panthers Hire Quenneville: The Panthers are expected to make a splash this summer in free agency but they also have made one behind the bench with the hiring of Joel Quenneville. The 60-year-old was considered by many to be the best coach available this offseason after Chicago let him go early in the regular season. He inked a five-year deal at a rate that could be greater than the $6MM he was making with the Blackhawks depending on team performance incentives. GM Dale Tallon is quite familiar with Quenneville having worked with him during his own time in Chicago and the two will now look to get Florida back into the playoffs. Devils Win Again: It wasn’t a particularly successful season on the ice for the Devils after a surprising playoff appearance in 2017-18, they had the third-worst record in the league. However, they did get some good news as they won the Draft Lottery and will select first overall in June. They weren’t the only team moving up as the Rangers gained four spots to move up to the number two spot while Chicago jumped nine spots to pick third. US NTDP center Jack Hughes and TPS Turku winger Kaapo Kakko are the top two prospects in this draft class. Voynov Suspended For 2019-20: While defenseman Slava Voynov is looking to make a return to the NHL, he’ll have to wait a while yet for his opportunity to do so after the league announced that he has been suspended for the entire 2019-20 season (including the playoffs). This stems from a domestic violence incident back in 2014, one that saw him jailed and suspended indefinitely by the league while the Kings terminated his contract. He successfully petitioned to dismiss his conviction last summer, paving the way for him to at least attempt to get back into the NHL although Los Angeles still holds his rights. That will have to wait at least one more year, pending a decision from an independent arbitrator after the NHLPA filed an appeal on his behalf. 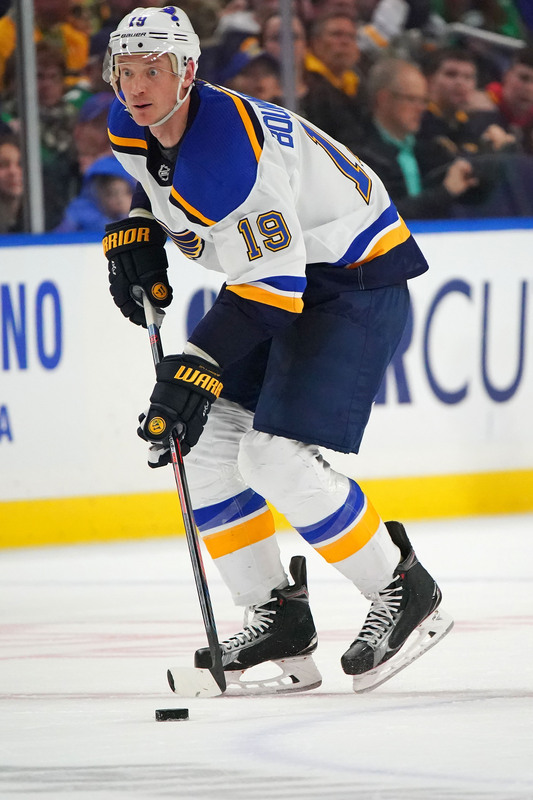 Bouwmeester Stays In St. Louis: It wasn’t a great start to the season for Blues defenseman Jay Bouwmeester. He battled hip issues and even spent some time as a healthy scratch and it looked as if his days with the team could be numbered. However, he had a strong second half and was rewarded for his efforts as St. Louis signed the 35-year-old to a one-year, $3.25MM contract extension. The deal represents a sizable drop from his current $5.4MM deal but is a better reflection of his expected role moving forward. Instead of being a top-pairing player as he was several seasons ago, he’s likely best suited to play a second pairing position next season. Late Additions: It’s rare that teams in the playoffs can add players that could very well get into the lineup but it happened on three separate occasions. First, the Blue Jackets signed defenseman Vladislav Gavrikov to a two-year deal and with three defenders currently out of the lineup, he could suit up quickly once he joins the team. Colorado then added top prospect Cale Makar to a three-year, entry-level deal after his college season came to an end and he could play as soon as Monday night. Lastly, Vegas inked the top scorer in the KHL, Nikita Gusev, to a one-year ELC and he will likely play at some point in the first round. The fact that these players were on the Reserve List of their respective teams at the trade deadline is what makes them eligible to play in the postseason and at least a couple of them could make an immediate impact. Colorado playing him is an absolute waste. You think a rookie will put you over and win you the cup? Go ahead,waste that year and protection in the expansion draft. You will end up unloading someone you don’t want to part with because of it. Love the Ducks. All that young rookie talent they had to shuffle. Then traded the players they kept less than two years later.